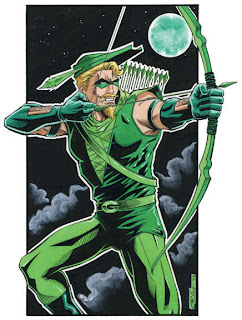 An Archer Superhero, dressed in a manner similar to Robin Hood, who fights crime with specialized trick arrows. Green Arrow was originally created by Mort Weisinger and George Papp, and first appeared in More Fun Comics #73 in 1941. Along with his sidekick Speedy, Green Arrow was essentially treated as a more light-hearted version of Batman. 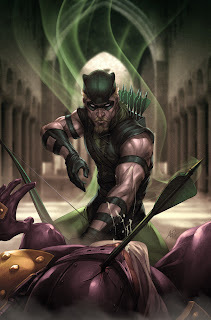 Idle millionaire Oliver Queen found himself stranded on a desert island, and taught himself archery to survive. Eventually, criminals came to the island. He used his archery skills to defeat them, and decided to keep fighting crime as a hobby. Shortly after beginning his career, Green Arrow met Roy Harper, an orphan who'd been raised by a Native American mentor on an isolated mesa. The boy was even faster with the bow than GA, and picked up the name "Speedy. While never a major hit in The Golden Age of Comic Books, Green Arrow and Speedy sold decently, and were members of the Seven Soldiers of Victory, DC Comics' second superhero team. After World War Two, the pair was moved to Adventure Comics along with Aquaman. As pet characters of editor Mort Weisinger, they were published continuously as backups to the Superboy feature all the way from 1946 to 1960. GA and Speedy then jumped to World's Finest until 1964. During this time period, Green Arrow changed very little, sticking to short, fun stories in which he used trick arrows to thwart criminals and save lives. Perhaps the best remembered stories are the short run in 1958 by Jack Kirby. In 1969, however, artist Neal Adams gave Ollie a new costume and his now-trademark forked beard. 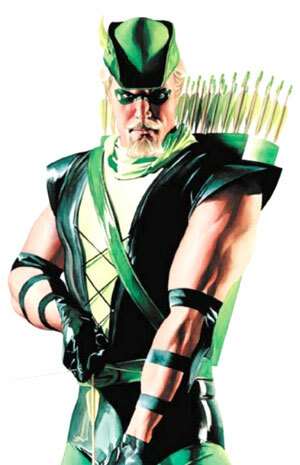 Inspired by this striking new look, writer Dennis O'Neil followed this up with a storyline in which Oliver Queen lost his money. A few nights on the street, dealing with the social services net from the bottom, radically altered Green Arrow's politics. From (at best) a "limousine liberal", Green Arrow became an outspoken champion of the poor and oppressed, advocating progressive social policies as a cross between Robin Hood and Abbie Hoffman. Also around this time, Green Arrow became romantically linked to Black Canary, at that time an immigrant from Earth-Two. Green Arrow was then teamed up with Green Lantern Hal Jordan in a series of socially relevant stories in which the "by-the-book" Hal and "plays by his own rules" Ollie deal with issues like racism, political corruption, pollution and overpopulation. Speedy had not been seen adventuring with his mentor in some time and this was made a plot point when it was revealed that Green Arrow's neglect had allowed Roy to become addicted to heroin. He recovered from this with help from Black Canary. After some years of being teamed with Green Lantern or appearing in back-up stories, in 1983 Green Arrow got his own mini-series for the first time. It sold decently, but was not followed up until 1987. As part of its new "mature readers" line, DC gave writer/artist Mike Grell the chance to reinvent Green Arrow again in The Longbow Hunters mini-series, followed by an ongoing series. Some radical changes were made, moving GA from the fictional Star City to Seattle, discarding the trick arrows for the most part, removing Black Canary's sonic scream and generally avoiding the more comic-booky elements of The DCU. This series also became notorious for the scene in which the assassin Shado rapes Oliver Queen, though it was mistakenly referred to as an affair by other writers in the years to follow. After Grell left the series, it was reintegrated with the rest of the DCU just before Zero Hour. After Oliver Queen was forced to kill his best friend Hal Jordan as a part of that crisis, Oliver retreated once more to the Buddhist ashram where he went once before after accidentally killing someone. It was here that a new character was introduced - an idealistic young monk and Green Arrow fanboy named Connor Hawke. Connor was later revealed to be Ollie's child by a previous relationship. Shortly after learning of their relationship, Oliver Queen died in a plane explosion. He gave his life to save the city of Metropolis and Connor became the new Green Arrow. Roy Harper, meanwhile, had become the superhero Arsenal. Connor joined the Justice League for a time but eventually sought the peace of the ashram once more. While there, he had visions which told him that his father was still alive.